This still leaves the NFL with a bunch of options, but as the Los Angeles Times’ Sam Farmer and Nathan Fenno report, they’re all problematic. Dodger Stadium and Angel Stadium are baseball stadiums, and not only does the NFL hate playing in baseball stadiums, but baseball teams hate sharing digs with football, which messes up their schedule and tears up the grass. The Los Angeles Galaxy‘s StubHub Center in Carson only holds 27,000 — though NFL stadium consultant Marc Ganis tried to put a happy face on this to the L.A. Times, saying, “There’s something interesting about playing in a smaller facility, to start with creating a scarcity of tickets and increase the level of interest early on,” yeah, right — and is run by AEG, which already has no love for the NFL after having its own downtown L.A. stadium plan shot down. That leaves the L.A. Coliseum, which would be fine but for two things: First off, USC’s lease on the Coliseum only allows it to host one NFL team, which would be a problem if, say, both the Raiders and Chargers needed temporary homes while waiting for a new stadium to be completed. Second, it’s really hard to get a bidding war going with only one serious bidder, so any team wanting to bunk at the Coliseum temporarily likely just saw its prospective rent go up. This probably isn’t enough to be more than a speed bump en route to a new L.A. NFL stadium (and team), but given that the finances of such a project already look shaky enough, you never know which is going to be the speed bump that breaks the camel’s back. (Yeah, I know the metaphor doesn’t really make sense, work with me here.) The fight to be the future home of the Raiders, Chargers, and Rams still seems like a battle that no one can possibly win — it’s one reason I don’t expect any resolution soon, but I guess we’ll get some hints, maybe, following the August owners’ meetings. Majestic Realty, the developers who want to build an NFL stadium in the City of Industry, now say they’ll redesign their stadium to be able to fit World Cup soccer there. “Because we’re building a new stadium, we could incorporate anything FIFA could want,” Majestic stadium architect Dan Meis told the Associated Press. Or to put it another way: This is still vaportecture for now anyway, but we can change it round if you like. The Oakland Raiders are talking to city officials about a new stadium on the site of the Oakland Coliseum that would be, according to team CEO Amy Trask, “an anchor for, or a catalyst for, an urban redevelopment that provides economic stimulus for the whole region.” From the sound of it, this is code for “ballpark village,” but Trask didn’t provide specifics. The city of Pasadena, meanwhile, actually made real news, approving a $152 million renovation of the Rose Bowl to take place over the next three football offseasons. The Pasadena Star News reports that “the project is expected to generate enough revenue to cover the debt service 1.475 times,” though it doesn’t provide details of whether this is via a more lucrative lease with UCLA or higher ticket prices or added tax revenues or what. The project would also be subsidized by the use of federal stimulus bonds, so taxpayers across the U.S. will each be tossing in a few cents for the Rose Bowl’s newly widened access tunnels. Rose Bowl renovation: your tax dollars at work? For those of you angered that our folks in Congress meet every so often to discuss the college football championship fiasco, consider that one reason a $163 million renovation of the Rose Bowl is being pushed forward is the possibility of tapping stimulus funds as one reason for doing so. The Rose Bowl with its huge capacity will host this year’s college football championship game on January 7. A New York Times report on New Year’s Day suggested that Rose Bowl folks fear going in the same direction as the Orange Bowl (the wrecking ball) if something is not done, but Times reporter Billy Witz explains that plans to merge renovations with an NFL team met with a variety of obstacles. Among them, community opposition, with many having recollections of Raider fans converging on LA in strange and intimidating costumes before Al Davis took his ball and moved back to Oakland, as well as concerns that a Soldier Field-style renovation might occur. In that instance, the historic facility lost its landmark status, and rightfully so. To avoid that problem, the Rose Bowl’s general manager, Darryl Dunn, has brought in Janet Marie Smith, best known for Camden Yards planning and Fenway renovation. As for why stimulus funds might be needed, Dunn indicated that they’d go after donors and look to events, but said, “We’re a stadium….We don’t have an alumni base.” The Rose Bowl currently owes $43 million on earlier renovation projects, so the $163 million renovation, if it moved forward, would push the renovation costs well above the $200 million mark. It is still small compared to the high price of recent professional sport venue construction, but 200 million bucks isn’t chicken feed either. 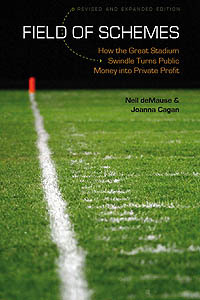 For those who are outraged by this, consider that you can fire up your TV this evening and watch the GMAC bowl, sponsored by a recipient of federal bailout money, and a few days later enjoy the Citi BCS Championship Game, sponsored, once again sponsored by a beneficiary of bailout funds. The Rose Bowl hopes to sponsor many more BCS games after renovations take place. If taxpayers seem to be funding the college football championship tournament both directly and indirectly, maybe we ought to have a little more of a role in fixing the mess!